Anything can happen at a Philadelphia City Council meeting. Glen Waldeck made that abundantly clear yesterday. 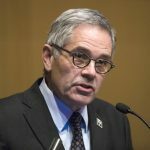 KYW has a recording of the song Waldeck played for Council President Anna Verna and the other council members during Wednesday’s budget session. Waldeck, of Delaware County, played his guitar and sang about the plans to extend Philadelphia International Airport to what KYW says wasn’t a pleased-looking Verna. A serenade sounds like a welcome break from budget reports.